Mini-pies are becoming one of the most popular trends in baking today. I love that when I am feeding a crowd at a party I can make mini pies and I don't have the time-consuming task of serving everyone individually when it comes to dessert. I can just serve my mini pies on a platter and let everyone pick what they want. Mini Pies are not just for dessert they can be for dinner also. 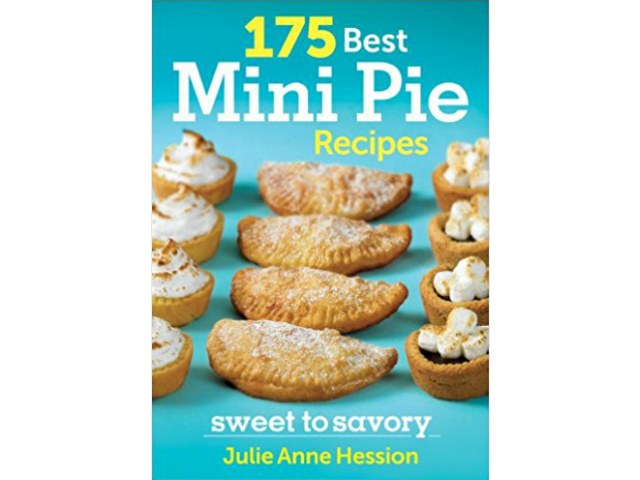 Check out the recipe below from the 175 Best Mini Pie Recipes the Chicken, Brie and Apple Turnovers would make a great dinner for your family. 2017 www.robertrose.ca Reprinted with publisher permission. Julie Anne Hession has combined her love of food with her love of words to become a successful chef, food writer, competitive cook and food blogger. Her sweet creations have been featured in People,O, The Oprah Magazine, Better Homes and Gardens and Food Network magazine. She has picked up the challenging hobby of competitive cooking, taking top national prizes in multiple battles and winning more than $100,000 in cash and prizes, bragging rights and most importantly, the seal of approval from Iron Chef Bobby Flay. "I love coming up with new ways to cook and present chicken. 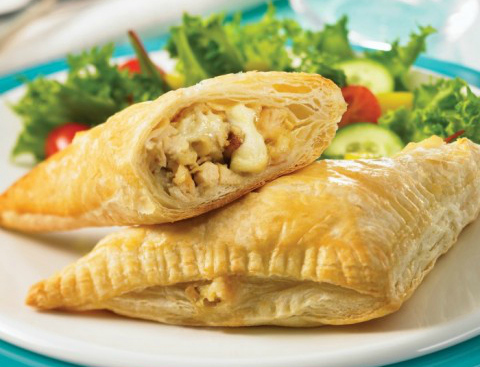 This recipe, a wonderful combination of chicken, apples, fresh sage and Brie wrapped in buttery puff pastry, is perfect for a weekend brunch or a luncheon, or light dinner served with a simple green salad on a busy school night," says author of 175 Best Mini-Pie Recipes, Julie Anne Hession, who thinks these are ideal for a school or work lunch or a comforting afternoon snack. 1. Filling: In a large skillet, melt butter over medium-high heat. Add shallot and apple; sauté until softened, 4 to 5 minutes. Stir in sage and nutmeg; season to taste with salt and pepper. 2. Sprinkle flour over mixture, stirring to coat. Add cider, reduce heat and simmer until thickened. Stir in brandy, if using. Stir in chicken and simmer for 2 minutes. Remove from heat and set aside to cool completely. 3. Divide puff pastry in half. On a lightly floured surface, roll one-half into a 15- by 10-inch (37.5 by 25 cm) rectangle. Using a pizza cutter or a sharp knife, cut rectangle into six 5-inch (12.5 cm) squares. Repeat with remaining dough. 4. Brush edges of squares with egg wash. Place about 1⁄4 cup (60 mL) chicken mixture in center of each square. Top with 1 slice Brie. Fold squares in half diagonally, enclosing filling. Pinch together edges to seal, and crimp with the tines of a fork. Brush tops with egg wash. Tips: The white rind of Brie is edible and is usually eaten along with the soft interior. If you don’t wish to include the rind, you may trim and discard it before layering the cheese on the chicken filling. 1. In bowl of stand mixer, beat all-purpose and cake flours and salt until combined. Scatter butter over top and mix at low speed until butter is the size of lima beans. Add water and mix at low speed just until the dough starts to come together 10 to 15 seconds. 2. Transfer to a floured work surface and gently shape into an 8-inch (20 cm) square. Using a rolling pin, roll out into a 10- by 18-inch (25 by 45 cm) rectangle. 3. Using a knife, lightly score dough lengthwise to make three 10- by 6-inch (25 by 15 cm) sections. Using a flat cookie sheet or large spatula, carefully lift right a third of the dough and flip it over onto center section. Repeat with left third of the dough, as if folding a business letter. Rotate dough 90 degrees so that the long (10-inch/25 cm) side is facing you. You have now completed one turn of the dough. 4. Lightly flour work surface to prevent sticking and reroll dough into a 10- by 18-inch (25 by 45 cm) rectangle. Give the dough a second turn by scoring into thirds and flipping over the right and left thirds as you did in Step 3. Rotate dough 90 degrees so the long (10-inch/25 cm) side is facing you. 5. Repeat Step 4 twice, to make a total of four turns. 6. Wrap tightly in plastic wrap and refrigerate for 1 hour. 7. Transfer chilled dough to a lightly floured surface with the long side facing you. Give the dough two more turns. Rewrap in plastic and refrigerate for at least 1 hour. Have you tried your hand at making mini pies? What is your favourite kind of pie to make?